Braising is a surprisingly easy cooking technique that can be used to turn affordable cuts of meat into meltingly tender, succulent treats. The basic idea is to slow roast a tougher cut of meat in a pot with a small amount of flavorful liquid until the connective tissue breaks down and melts into the sauce. 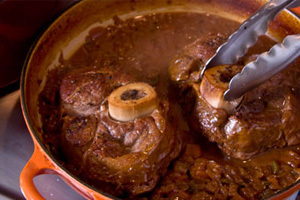 The braised dish Americans are most familiar with is probably pot roast, but it is also often used for braised lamb shanks, Italian osso bucco, and short ribs. Check out our Braising Liquid Recipes for some great options, all perfect for this technique. 1. Remove the meat from your refrigerator and let it come to room temperature. 2. Dry off any surface moisture & season the meat with salt & pepper. 3. Get a thin layer of oil in an oven-safe pot or Dutch oven very hot on the stove. 4. Carefully lay the meat into the oil and sear it on all sides to develop a flavorful brown crust. 5. Once all your meat has been seared on all sides, remove it from the pot and set aside. Reduce the heat to low and add vegetables (often carrots, onions, and celery (aka mirepoix)). 6. Sweat the vegetables (sauté to release their flavor and aroma, but not take on color) until soft. 7. Deglaze the plan with a flavorful liquid or combination of liquids. Commonly used liquids include alcohol (usually red wine, but some recipes may call for beer or fortified wines) and stock or broth. 8. Gently scrape the bottom of your pan while simmering the liquid to release the flavorful browned bits. Once the liquid has reduced somewhat, add any herbs (thyme, rosemary and bay leaves are popular choices). 9. Return the meat to the pan, add the lid, and move it to the stove to slowly cook for several hours over low heat, until the meat is fork tender. Alternatively, you could do your braising in a pressure cooker on the stovetop, which will cook your meat significantly faster. Informative post…I braise occasionally but usually ‘by the seat of my pants’. It’s good to see the official technique.